Setting up The Drink Exchange is an incredibly easy process. We remotely install and configure the program on to the ePOS PC. No additional hardware is required – just a compatible ePOS system and at least one TV! We can have you up and running and trained within 90 minutes. The bar is in control of everything…Products featured, MARKET CRASHES, minimum and maximum prices and even how quickly and by how much prices change. 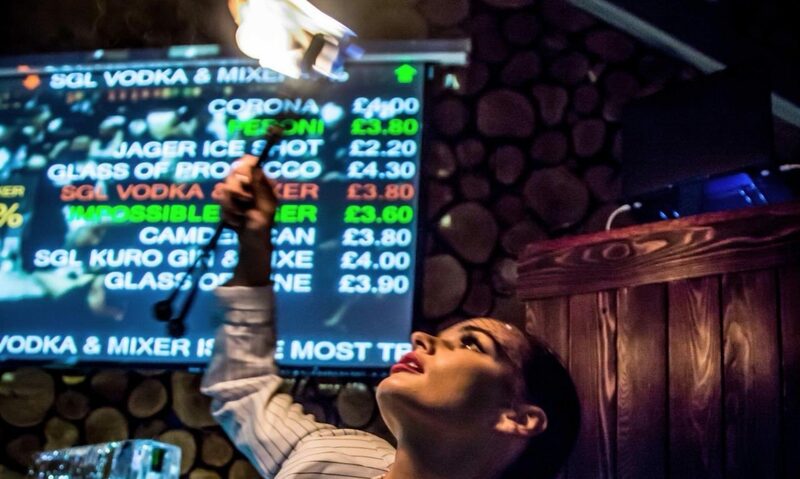 The Drink Exchange can be linked to a bar’s Twitter feed…with INSIDER TIPS announced to all your followers minutes before MARKET CRASHES occur! Great fun for customers in the bar but also telling people in other bars they are in the wrong one! MARKET CRASHES can be scheduled for quiet times or times of traditional exodus – extending customers’ visits in the bar with something always happening or about to!